If there is one thing we Americans can do, it’s take something cool and exploit it for personal gain. And when it comes to the Defense Advanced Research Projects Agency (DARPA), such a move could change marine ecosystems forever. The agency’s new program, Persistent Aquatic Living Sensors, or PALS, would genetically modify aquatic wildlife like fish and coral reefs to track enemy vessels like submarines. 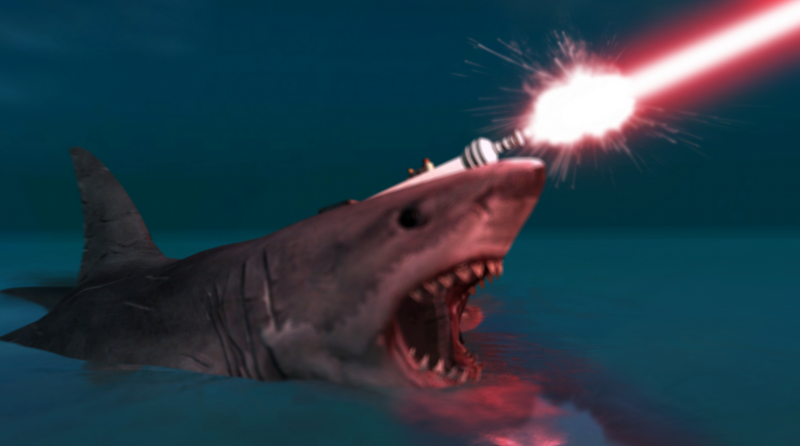 (Unfortunately there’s no talk of lasers on sharks… YET.) DARPA officials say aquatic wildlife–which can sense sound, electricity and more–have self sustaining qualities that could outlast any hardware used to detect underwater craft. Despite the acronym “PALS” conjuring up an image of a smiling cartoon seal high-fiving a military scientist, the idea of our oceans being used as military zones—and the prospect of a mutant fish takeover—is cause for apprehension, at best. Thus DARPA was quick to reassure environmentalists that it would only expose genetically modified organisms in “contained, biosecure facilities,” and avoid using endangered species and intelligent mammals. But DARPA’s promises mean nothing if its intent is to release these modified mammals into our oceans. This could wreak irreversible damage to underwater ecosystems, and considering the Navy uses dolphins and sea lions to detect underwater mines, their claim that they’ll avoid using intelligent mammals must be taken with a grain of salt. Our country’s military industrial complex is so entrenched that if the Pentagon could arm the manatee wearing the “Come At Me Bro” t-shirt from that stupid Geico ad, it would. Having the audacity to militarize aquatic wildlife means ignoring well documented evidence that our ecosystems have suffered enough. The Pacific Ocean is so warm that pieces of starfish and whales are washing up onto beaches. Whales are dying on Atlantic Ocean shores, from as far north as Maine to as south as North Carolina. The Arctic Ocean could be almost entirely free of ice by 2040, jeopardizing the lives of polar bears, seals and countless other species. At this point, the message to DARPA isn’t so much “Don’t ruin a good thing,” as it is “Don’t make things even worse.” Scientists have until the end of April to submit proposals to DARPA on how to help marine wildlife adapt for warfare. In a perfect world, the military would have until the end of this month to prove why marine wildlife should be militarized at all. You have GOT to be kidding me. Have these people never watched any SciFi? Or hell, even PBS has shown the effects to eco systems when new species are introduced where they aught not be! This is a BAAAD idea! WTF are they thinking???? And who are the idiots working for these subhuman military subspecies? Sure wish this was a joke, but sadly they will not stop until we are all dead.